Ethan Abraham wrote: On a related note, anyone have a good rec for a set of stones to sharpen with? Ordering online is confusing to say the least, as it seems like a lot of what is on amazon is not properly labelled. Steel is less a matter of "better or worse" than "pros and cons". Do you want stainless or carbon? Do you want a knife that can be sharpened to a sharper edge or a knife that will hold a reasonably sharp edge longer? Etc. I picked ginsan steel for my knife because I was OK with merely stain-resistant (as opposed to true stainless, which requires 20%+ Cr in the alloy), and I wanted a knife that behaved more like a carbon steel. I don't think ginsan steel is available for $100 though - probably more like $175+ for a gyuto. 19C27 is also a nice steel, that should be in your price range. VG-10 is also really nice, definitely in your price range - my mom had a set of VG-10 knives that took a shitton of abuse. I've never used AEB-L which some folks love, and though I know there are value AEB-L knives out there I don't know whether they have good heat treatment and such. Thanks David! I am curious to try something more like carbon steel since I have worked with Wusthof and the like for several years so I could go away from straight stainless. Great read. I have a few knives of mixed nature. The best knife I have used in a long is is this $60 Shun. It holds its sharpness and feels great in hand. Outshines my Shun Classic 8 inch Chefs by a Kilometer. Except that producer and steel are inseparable, because heat treatment affects the steel. I've used other AEB-L knives that are nothing like the Devin Thomas that I used to own. Plenty of other examples, there's a real wide range in what to expect from a VG-10 knife. This "cleaver" is a great bargain if you want to try a chinese chef's knife without the maintenance of carbon. 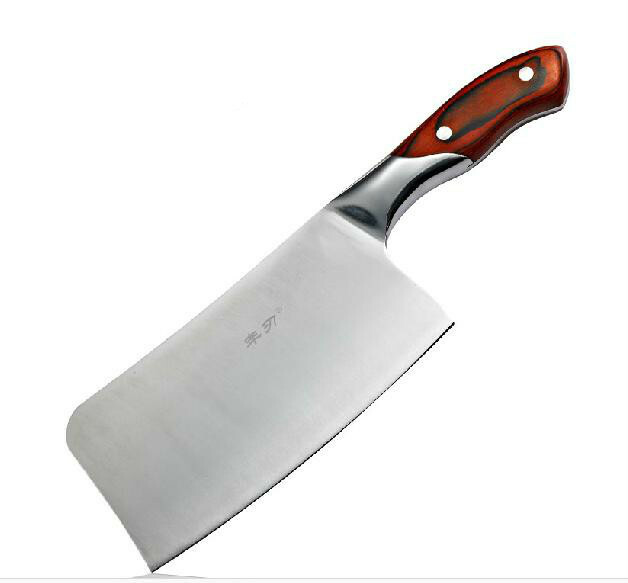 I put cleaver in quotes because it's not a cleaver, it's chinese chef's knife. The fruit knives from the same line are great little knives. Haven't tried any of the other knives, but no reason they shouldn't be good values. I was going to recommend my "old faithful" which is a Hiromoto Aogami Super Gyuto in whatever length you like or the Santoku size, but unfortunately, the line is discontinued. It's high carbon steel cutting edge, clad with (essentially) pre-patina'd other steel. If you really want a stainless-type blade, then I'd recommend AEB-L steel. I never had much luck with VG10 et al steels. Sure. But steels behave in a certain way, and you need to figure out what kind of behavior you want. Do you want something durable? Something easy to sharpen? Something that holds an edge well? That is all highly steel-dependent. Then, I agree, there is a difference b/w the best and the worst because of heat-treatment, stamped v. forged, etc. For me, I don't love stainless b/c I grew up using carbon in my mom's kitchen, but she and I have (independently!) found high-carbon stain-resistant steel to work for us. I've been very happy with my Masanobu VG10 knives but I'm someone who doesn't want to be sharpening my knives all the time. Also, after buying them I read some knife forums which seem to feel that while the quality is very good they are a bit overpriced. I know Suzanne likes Misono and our blind tasting group has given them as presents for some hosts who have liked them a lot. It sounds like you'd really like the "semi-stainless" knives of Nakaya Heiji. They sharpen easily and hold an edge a really long time. You can Google for the website. The 240mm wa-gyuto is 26,000 yen plus shipping. Those look awesome - thanks for the tip. So I'm curious whether people have opinions on something like a Miyabi Kaiven II made of VG10 would be worth $100 or whether I would be better off with any of the cheaper chef knives from like chefknivestogo.com or like the tojiro dp series. I tried the Miyabi and it felt very nice so would be interested in something like that. I see plenty of different things on EBay from places like hanonbam (sp?) but not sure of their quality relative to others. What knife do you pros recommend for cutting onions? Weep almost every time regardless of how sharp my Victorinox or Wusthof is. Just not thin enough I guess. A specific knife just for cutting onions instead of a chef's knife? I don't know. Help please! Colby Scott wrote: What knife do you pros recommend for cutting onions? It's not your knives. The trick is to make someone else cut it. If you don't have a rube handy, then wear some lab goggles. Chilling the onion in the fridge first also makes it less potent. Colby Scott wrote: Weep almost every time regardless of how sharp my Victorinox or Wusthof is. So he weeps over having the wrong knife? Ironic that I was asking about tears but Todd French is right also -- it IS hard to get through an onion quickly. to slice his half-onions in a few seconds and he never shed a tear. What is this style of knife called? "Chop" knife? That doesn't seem right. He was fearless so perhaps I just need to work on getting through the onion faster. OK I answered my own question it seems. Can anyone recommend a very thin Japanese or German cleaver? Judging from the reviews I answered my own question for the second time. Colby Scott wrote: Cleaver maybe? I volunteer doing kitchen prep like chopping fruits and veggies, and 99% of the time when volunteers cut themselves, it's over onions. Indeed, missed 'weep', apparently...but I do notice that my incredibly sharp Japanese knife struggles through onions, like there's extra resistance...however, the weeping issue is apparently solved (via my daughter, who saw/heard it on YouTube, apparently) by chewing gum while cutting! Never tried it..
Todd F r e n c h wrote: Indeed, missed 'weep', apparently...but I do notice that my incredibly sharp Japanese knife struggles through onions, like there's extra resistance...however, the weeping issue is apparently solved (via my daughter, who saw/heard it on YouTube, apparently) by chewing gum while cutting! Never tried it.. I think I will try chewing gum the next time I tell my husband to cut the onions. He cuts, I chew! Not me, not even close to my turtle-rate. mike pobega wrote: Great read. I have a few knives of mixed nature. The best knife I have used in a long is is this $60 Shun. It holds its sharpness and feels great in hand. Outshines my Shun Classic 8 inch Chefs by a Kilometer. I grabbed one of these from Home Goods. Thought I might give it away at that price but then I tried and was shocked by how great it was. Beyond bang for your buck with this knife. I hunt a lot and just ordered a murray carter boning knife. Pretty stoked to try it out on the next pig I shoot. David J wrote: I hunt a lot and just ordered a murray carter boning knife. Pretty stoked to try it out on the next pig I shoot. Be interested to hear your thoughts on the knife - I use Dozier. And also where you hunt! Anyone try Takeda ? thoughts ? I was fascinated by Japanese vegetable cleavers (Nakiri, I think, or perhaps a sub-set of Nakiri?). I went cheap because I wasn't sure. I got this around Christmas and have used it almost exclusively for vegetables since then - https://www.amazon.com/Mercer-Culinary- ... able+knife. Obviously, I'm not in the high-end market. My standard chef's knife is the Victorinox/Fibrox. Nick Gangas wrote: Anyone try Takeda ? thoughts ? Love Takeda in both carbon and stainless. Great edge retention and love the fit and finish. I bought one of thesehttps://knifewear.com/collections/fujim ... kiri-150mm and love it. Great site for Japanese knives as well. Great, thanks now I HAVE to get one of those, perfect size if you don't want to go the full on cleaver. I know this sounds lazy, but I'd like to find that knife in all stainless just for ease of care. Love the stainless, love the stamping. Don't you have to stay after these stainless ones a little extra to keep the edge? I owe you a favor Rob, thanks a mil. CJ Beazley wrote: BOOM! SOLD! Need some help. A Japanese knife (Shun??) I bought is rusting. What's the best way to get rid of the rust? Or, at the same site, get a new knife. Thanks but do I need medium or fine? I bought the knife locally so may take it back to them and get a pro to take care of it. Call JKI, ask for Jon, tell him what your problem is, and he will get you situated. in a similar vein, I was breaking down a chicken and chipped my 210 gyuto pretty significantly....assuming I need professional assistance to help, but any other advice would be appreciated. I just read this article and found it to be useful. it's more for the person just getting into knives who needs some general knowledge on steel and which knife for specific uses. The experts here probably won't get anything out of it. Scott Butler wrote: I just read this article and found it to be useful. it's more for the person just getting into knives who needs some general knowledge on steel and which knife for specific uses. The experts here probably won't get anything out of it. Useful for someone like me! Thanks! For the money, my Misono UX10 is hard to beat. I have a ton of different knives but this is the best I have owned. [quote="Barry Paul Price"][quote="Scott Butler"]I just read this article and found it to be useful. it's more for the person just getting into knives who needs some general knowledge on steel and which knife for specific uses. The experts here probably won't get anything out of it. My in-laws gave me a set of Shun classic knives, reviews were so so but I like them so far. I added a Shun Premier 6.5 utility knife, so beautiful! My first ever "good" knives, though we have some good workhorse Wusthof knives, and some nice Henckels steak knives.